RANDY BUEHLER REPEATS AS CAESAR: Reigning Caesar Randy Buehler made it two in a row by successfully defending his perch atop the BPA rankings to become our second back-to-back top gamer. However, the Washington native's margin of victory was slim, besting 2004 Caesar James Pei by only ten laurels—37 less than his 2011 margin of victory over his predecessor, Texan Stefan Mecay. And unlike 2011 when he claimed both the Caesar and Consul titles, he was unable to best Nick Henning two times in a row as Nick rose to Consul—completing his rise from the WBC Juniors program to claim Master of Horse during WBC week. Complete details on our top Award winners and the tally of our Top 25 gamers for 2012 are available at http://boardgamers.org/wbc12/caesar.htm. PEI MASTERS WAM AGAIN: "Master" James Pei again dominated the field at the 12th Annual Winter Activation Meeting for Card Driven Wargames by winning two of the four tournaments. James held sway in both Hannibal and Washington's War by going unbeaten in a combined eight rounds of play over a small but enthusiastic field. Marvin Birnbaum took top honors in Twilight Struggle while Greg Ottoman triumphed in Labyrinth. More details are available at http://boardgamers.org/specific/wam13.htm including links to updated laurel totals and event reports for all four tournaments. WBC EVENT ASSIGNMENTS: The Orphans List has been updated to reflect the first wave of GM commitments for WBC 2013. In all, 46 eligible events remain orphaned without a GM commitment by a current member with less than 30 days remaining until the schedule is set in stone. Waiting in the wings are 17 eligible alternates waiting to replace events without a GM commitment. Check out the endangered list at http://www.boardgamers.org/wbc/orphans.htm. To save one of these poor orphans submit an event form at http://www.boardgamers.org/forms/SubmitEvent.php no later than March 15th and become a current member if you're not already. LAST CHANCE FOR $70 MEMBERSHIPS: The cost of Sustaining level memberships good for the entire week of WBC admission is set to rise $10 on March 1st. Beat the price increase by submitting your membership now to http://www.boardgamers.org/forms/MemberForm.shtml. Exhibitor and Vendor rates also increase on March 1st so commit now for the best price. WBC HISTORY UPDATED: Our Annual Year in Review summary and listing of top Centurions is now posted at http://boardgamers.org/archive/history12.htm. BPA MEDALS LIST UPDATE: Our annual compilation of events won and career titles is now posted a thttp://boardgamers.org/medals.htm with Bruce Reiff again leading the parade in three of five categories (but his lead is shrinking)! BPA's TOP 25 CAREER GAMERS: James Pei increased his comfortable lead over most of the field and stretched his advantage over Bruce Reiff to 519 laurels in the latest annual Tally of Career laurels which can be viewed at http://www.boardgamers.org/l_sums.htm#top25. The rest of us mere mortals can check our progress at http://www.boardgamers.org/l_sumsall.htm. 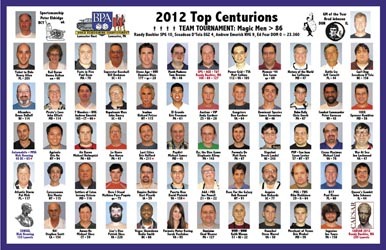 2012 PATRONS: BPA's list of Patrons for 2012 is now posted at http://boardgamers.org/wbc12/patrons.htm. Please report any inaccuracies to conventiondirector@boardgamers.org no later than Feb. 28 to ensure an accurate listing in the upcoming Yearbook. LAST CALL FOR 2013 BoD NOMINATIONS: All BPA members are hereby notified of their right to nominate members for the three Board seats whose terms expire at the next WBC. To appear on the ballot, a member must be nominated in writing by at least three members; one of which must be himself/herself. Nominations must be signed and received at BPA, 7766 Valley View Court, Hickory, NC 28602 no later than Feb. 28 to be eligible for election in that year. NOTE: Email nominations are NOT acceptable, nor can a member nominate more than one member for the Board. When contemplating nominations, members are urged to consider that the BPA conducts most of its business by email and needs Board members who are able and willing to offer their time and skills to the organization in a timely manner. Board members should be considered more for their ability to contribute to the running of a successful company than for their attachment to any particular game or genre. Besides forwarding a signed nomination, each nominee should submit by March 1 a statement not to exceed 100 words summarizing what they can contribute in service to the Board of Directors of the BPA. The nomination form is on line at http://www.boardgamers.org/bpanom.htm. PRO GOLF: Its time again for that ultimate test of skill: PBeM Pro Golf! Can you steal Yoshi's green jacket? The fourth annual BPA PBeM rendition begins on April 1, 2013, approximately one week before the 2013 Masters tournament begins. Email GM Bruce Monnin (bdmonnin@nktelco.net) to enter. For details, see the event webpage at http://www.nktelco.net/bdmonnin/pro_golf_PBeM_2013.html. ADVANCED CIVILIZATION TO START: Play continues in the 2012 Final. After suffering an especially nasty civil war, Kevin Worth's Iberia has dropped from the top spot to third. His position as leader has been filled by Romain Jacques and his Illyrians, who hold a 100 point lead over defending champion Mads Lunau's Egypt. Signups continue to be accepted for the 2013 version. Email kevinyouells@gmail.com prior to Feb. 26 to sign up. The next tourney begins on March 1st! The event structure will involve two concurrent preliminary games with game winners advancing to a Final round. The full event should take approximately 14 months. Full information is located at http://bpa-civ.rol-play.com/. SPEED CIRCUIT: Racing is added to the PBeM menu for the first time starting March 15. Check out the rules at http://lucidphoenix.com/sc/wbce/ or email Robert at wbcspeedcircuit@verizon.net. There will be two qualifying heats qualifying at 6 (# of races) from each heat for a 12-car Final. Total time for the event should be approximately 8 months with a 36-hour response time between moves. WAR AT SEA PROGRESS: The Ninth BPA War At Sea PBeM Tournament began on Sept. 1, 2012. The single elimination event drew 41 entrants and is now down to the final four. In one semifinal, Tim Tow received a 1.5 POC bid to play the Axis against Ed Menzel’s Allies. In the other bracket, Vince Meconi gave a 1.5 POC bid to play the Allies against Rob Drozd’s Axis. There have been 36 games completed so far, and the Allies have a 20-16 advantage. The average bid has been 2.0 POC. For the bracket for this year, see: http://www.nktelco.net/bdmonnin/was-brack-2012.htm. The next event will run in either a Swiss or Swiss-Elim format with a two-month time limit per round. Instead of bidding for sides, the Axis will get 2.0 POC at the start of each game. Sides in the first round will be randomly assigned, and in any other matchup where both players have played each side the same amount of times. When one player has played a side more often than his opponent, his opponent will be assigned that side. Send your comments to bdmonnin@nktelco.net.